Dated from the 19th century, Ca. 1880, a cast iron aquatic group with a putto crowned with reeds and delicately dressed in a simple drape, riding a dolphin. He holds a shell in his right hand, while the left seems to move over his head. 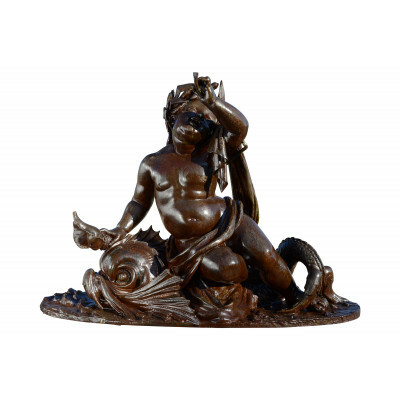 The model for this group belongs to the catalog of the foundry Ducel J. J. et Fils - Maître de Forges à Paris - Rue du Faubourg Poissonnière, 26. Planche 218, No. 10513 (our illustration). It will subsequently be published by the foundry of Val d'Osne.